Right at the heart of the Festival is an amazing fun, free family day out. Culture Day is jam-packed with performances, exciting exhibitions and loads of have-a-go activities all across Forres. 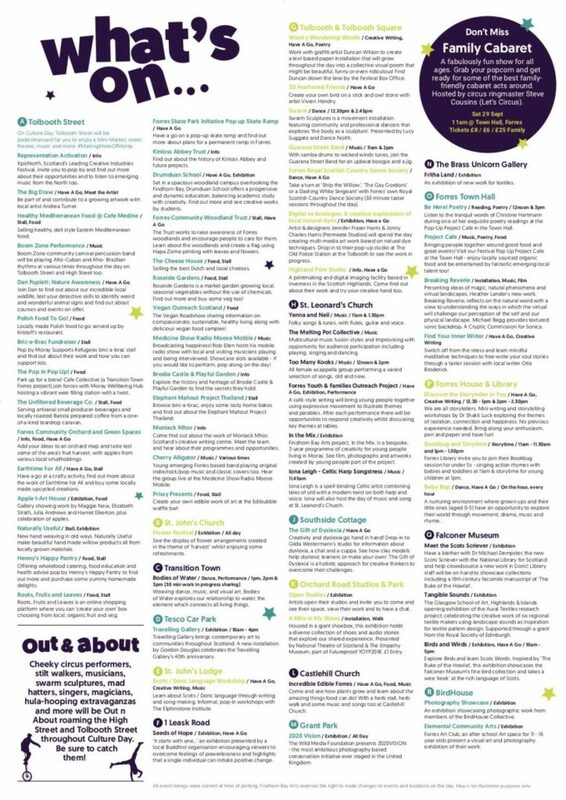 There’s so much happening on Culture Day we can’t list it all here, but don’t worry you’ll be able to download a guide or pick one up from the Festival Box Office beforehand. Here’s a wee taster… embrace the festival atmosphere by getting your face painted then join in a wee jig with Scottish Country dancers before having a browse at the Making More of Moray mini market. Or perhaps you’ll giggle through the madcap fantasy world created by the Mad Hatters of Moray before watching a live music session on the High Street. Or you could catch performances from emerging artists at the Festival’s Pop Up Cafe before joining the throngs on Tolbooth Street for some street theatre. It’s up to you! Can my group get involved? Culture Day is all about celebrating Forres and our creative community. It’s a brilliant opportunity for local arts, heritage and community groups to show us what you can do! You probably meet all year long and do all sorts of great things so this is your chance to share your efforts with lots more people! Apply to take part before 30 July 2018 via our website. All over Forres! From Grant Park to Tolbooth Street – the streets, parks, shops and public buildings will be teeming with street theatre, live music and lots more. We’ll crack on of course but some events may move indoors. Keep on eye on our social media for live updates or ask our Out ‘n’ About guides. Tolbooth Street will be closed to traffic but the High Street will remain open. Please take care when crossing roads and use designated crossing points. All the usual car parks will be open and overspill parking will be available at Forres Academy. Culture Day couldn’t happen without participating groups giving their time voluntarily. It is a free event so many people can enjoy it, but if you can afford a small donation it will be gratefully received and will go towards supporting this event.